Van rentals, convertibles, luxury cars, SUVs and sports cars are some of the most popular & highly rented categories at the Columbia Metropolitan Airport. Rent a car for Columbia Metropolitan Airport in just three quick steps - search, compare, reserve! Cancel your Columbia Metropolitan Airport car rental for free, up to 48 hours before the pickup time. Choose car rental service of USA Cars Rental for easy and comfortable traveling from Columbia Metropolitan Airport. We are a known online car rental company offering discounted Columbia Metropolitan Airport (CAE) car rental services. We offer a huge fleet of cars for your car hire from luxurious, compact, and SUVs. You can be rest assured that you will get the most competitive Columbia Metropolitan Airport car rental prices. When you rent a car with us, you get additional inclusions like Unlimited mileage, theft protection, collision damage waiver, roadside assistance and 24/7 customer support. The airport has got 2 runways that measure 8000 feet and 8600 feet in length. The runways can lodge aircraft of any size, also Boeing 747. You will also find a police department, a fire station and a post office in the airport itself. Around the airport there are decorative ponds that are often used by the fire department in case of emergencies. The 2 sidewalks of the airport are each 200 feet long. This airport also has a tower that controls the air traffic which is 105 feet tall. The airport is full of all the amenities which you would be expecting from any standard airport. The airport also maintains a Foreign Trade zone and a cargo terminal which is the Columbia Airport Enterprise Park. It recently completed a terminal costing $45 million. A beautiful city at a distance of 3.56 miles from CAE Airport. The nearest airport to this city is CAE Airport at 9.3 miles. City located at a distance of 12.7 miles from the CAE Airport. This city is at a distance of 36.8 miles from CAE Airport. 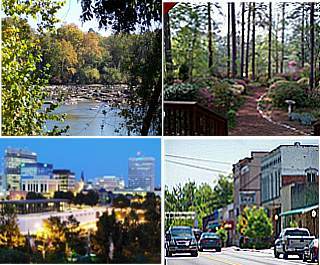 Sumter is a beautiful city at a distance of 51 miles from CAE Airport.